We have read so many picture books lately that we have a backlog of them to review! Two of these are ones that Z loved and one was not quite a fit for our family. 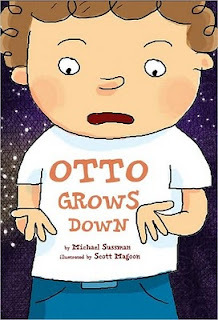 This first book, Otto Grows Down by Michael Sussman and illustrated by Scott Magoon, is the one that wasn't right for us. The simple reason -- Z is an only child. This is a story about a boy that resents his baby sister and wishes her away on his birthday candles during his sixth birthday party when she is getting more attention than he is. The wish backfires though when time starts moving backward. His sister is returned to the hospital but only because she hasn't been born yet. And as Otto passes back through time, he begins to regret his wish and tries to reverse it. It takes a very strong wish on his first birthday to return to the normal timeline and get his family back. There are quite a few picture books about sibling rivalry and Z just doesn't get it. I think they even upset him a bit because the siblings are being mean to each other so often. I'm not sure we would have liked this one anyway as it was just a bit strange. When time is moving backward, paintings are undone, trash is taken back into the house and, well, food takes the reverse trip through the system. This was something I really didn't need to have a mental picture of! This version of the classic Old Lady story is called There Was An Old Monster! by three generations of artists -- Rebecca, Adrian and Ed Emberley. This is a cute book with some wacked out illustrations. The monster starts by swallowing a tick (that strangely looks just like a spider), then some ants, a lizard (that appears to actually be a chameleon), a bat, a jackal, a bear and finally sets his sights on a lion. Unfortunately, the lion turns out to be bigger than the monster and the monster ends up being the one who is swallowed. Z loved this one -- as would most adventurous children under the age of six or seven. Z has always liked There Was An Old Lady Who Swallowed a Fly and I'll admit that I was worried that he would be upset that it was changed in this book. Sometimes he gets ideas about things being a certain way and doesn't like them to be altered. Luckily, this was fun enough to satisfy even him! 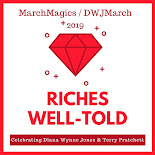 You can download a companion song to the book from Scholastic's website. The final book, Boris and the Wrong Shadow by Leigh Hodgkinson, was the one that excited us the most. Z has started making shadow puppets lately and so a book about shadows was just right for us. Boris the cat wakes up from his nap and immediately senses something is wrong. This is confirmed when he gets up and sees his shadow on the wall -- it's a mouse shadow instead of a cat shadow. The other cats make fun of him, the birds aren't scared at all and he's starting to worry when he notices his own shadow walking down the street! He finds that it's attached to Vernon the mouse. Vernon says that while Boris was sleeping, his shadow got bored and walked off and Vernon couldn't resist trying it on and seeing what it felt like. They work things out and Vernon ends up getting the strength he was looking for -- by becoming friends with Boris. This is an adorable book! The collage-style artwork is bright and has a wonderful texture. The drawings are similar to Lauren Child's but different enough to feel fresh and unique. There are many different fonts used and sometimes it seems a bit overboard but overall, we loved this book. There's another Boris book and I think we will try and find it! Support our site and buy Otto Grows Down , There Was An Old Monster! and Boris and the Wrong Shadow on Amazon or find them at your local library. We borrowed our copies from the library. Thanks so much for your glowing review of Boris and the Wrong Shadow. We are thrilled you like it and hope that Z liked it too! We posted your mention on our Facebook fan page. Are you a fan? That Otto book sounds like a pretty big concept for little kids!!! And I love the shadow one ... what a cute idea! And I'm sure my Little One would love the monster book. Lovely reviews - thank you. We have the same problem with sibling rivalry themes here too. They're for when she's older I think and more able to experience things vicariously. Thanks for stopping by, Elizabeth! We can't wait to check out Boris' other adventure! Jenners - Yeah, it was kind of heavy! Jux - Agreed. When Z is older, I'm sure he will need to know about things that other kids go through and how to apply relational behavior to friendships but since he's just five right now, it's a bit out of his life view.